Last Saturday we had a special show of our play 'Loitering' directed by Satchit Puranik, which is based on the ideas of the book 'Why loiter?' and the movement 'Why loiter?' for a group of 35 odd seventeen year old students from an international school. This bright and articulate group is attending a workshop on 'Gender and photography' and as part of that their teacher has exposed them to the book, the movement and the play. I personally think its a brilliant idea and wish I had teachers when I was growing up who would do the same. Expose me to ideas so real and so idealistic, without having to sit in a dreary classroom and read from boring books. Hats off to such projects and such endeavours by young teachers. After the show we had a question and answer session with the students which was supposed to last half an hour but lasted for almost two hours. They had several questions about the movement, particularly. I tried to quickly go back to when I was seventeen years old and how did I think then. And my own seventeen year old self told me that I should be more tolerant and accepting of the questions because even my seventeen year old self thought that something that doesn't change the world or at least a few billion people isn't worth it, something that seems small and slow is to be dismissed and an individual, internal change is so blase that it is not even worth a mention, not even to myself! My seventeen year old self also had vague and absurd notions about the 'poor' people, that they only work work work, their lives are so miserable, they don't have a concept of 'fun', they never crack a joke, they never laugh or smile or tease or flirt, or sing or lie down on soft grass and stare at the stars and dream. Oh, foolish, ignorant, stupid seventeen year old me! Then I imagined this group, that is seventeen year old NOW, when their lives probably are enriched by social media, google and Wikipedia and most of them lead much more protected lives than I ever did. I also realized that as a seventeen year old I did not have to think about changing the world, if I could just iron my school uniform and polish my shoes and take out the dog for a walk once a day, my parents were happy with me. But these children face the pressures of being so much more than that. They have to be entrepreneurs, leaders, debaters, thinkers, activists, and what not. They know everything about the whole world, the problems the world faces, the problems India faces, the bleak future ahead of us, global warming, crime against women, terrorism, nuclear deals, Donald Trump, ISIS, Boko Haram, blah blah blah blah blah! Then it struck me, that they found the idea of 'pleasure', 'fun', 'doing something for oneself', 'changing things one person at a time', 'changing something internally, for yourself', so alien, so foreign, so distant, because they have forgotten what simple joys are, or atleast find the idea of simple, personal joys 'not worth it'. Maybe, but maybe, just maybe, because the problems are so huge and complex, the solutions could be small and simple. Satchit and I kept reiterating that loitering is simple fun, and would become an oxymoron if I had a loitering 'Head office' in Mumbai from where I was in touch via skype with all the loitering 'branch offices' where my loitering 'workers' made people loiter, and then send me the attendance sheets that I then filled into my main excel sheet and mailed to the CEO of the multi national company that was funding our loitering! It sounded just as absurd to them as it did to us. I also confessed to them that if I had asked myself all the questions that they were asking me, I would have felt so hopeless, small and depressed that I would have scrapped the idea of loitering even before doing it. They all laughed! I told them that when I read the book, it spoke to me, not to make a large scale movement, but to just, get out of my own house, and loiter. It just so happened that others found the idea interesting and joined me. Loitering cannot be forced, it cannot be asked of someone, it has to come from the individual, it has to be fun and joyful and simple, otherwise it is not loitering, it is work. We told them that this idea of 'expansion' and 'what about them' and 'how do you plan to change the world' may not be quick and straightforward, but may take years and decades and may never happen, but its important to keep doing it to change yourself, your friends, your family, your neighbourhood and ideas spread, ideas are replicated, borrowed, are sources of inspiration. I told them that similar movements have started in Jaipur. Aligarh, Pakistan and it is not a coincidence, its a collective. 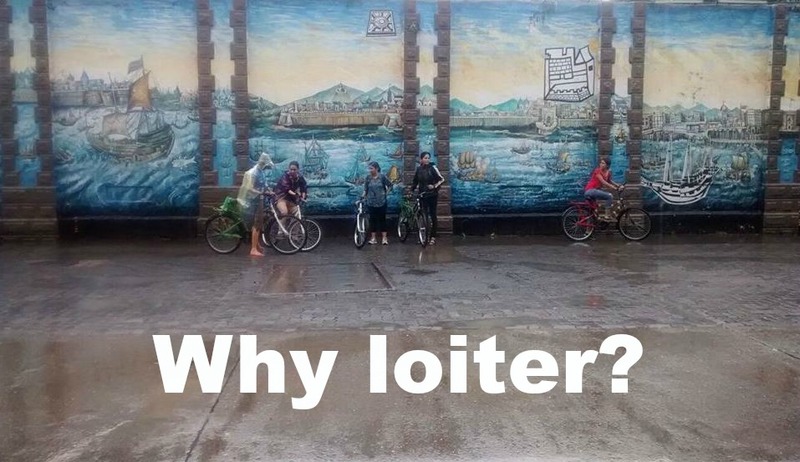 The only way something like a why loiter movement can be sustained is if it is locally pioneered, is fun, is personal. I told them about the blog and that we have readers from across the world that often share stories of their own individual loiterings and how sometimes what they read here inspires them to loiter. I told them that I conducted a workshop with tribal women in Jharkhand about the ideas of loitering. That seemed to impress them a little. By the end of the two hours we did manage to erode some of their ideas of what a movement means and what it CAN mean. Some of them also said that they would love to start loitering with their friends in their own neighbourhoods. I said, 'of course, there is no copyright on loitering, in fact, there is a copy left on it!' They laughed, but it is true. Loitering is a phenomenon as old as life itself, its just that we have now forgotten its simple pleasures. The idea that a movement, a revolution has to be for OTHERS and not for MYSELF is something that is propogated, but is so not correct. How are you going to change others when you arent sure of what you think, practice and advocate? How are you going to 'make' others loiter and have fun when you have forgotten what loitering and having simple joys means? How are you going to sustain something that you, in your head, have made so serious and joyless? 'Be the change you want to see in the world'- M.K. Gandhi. Simple words, but so true. Lets revisit these words by the man who did change the world by changing just himself.